The Juke is the original crossover. Built in Britain with unmissable styling and eye-catching design. Nissan has taken the idea of a Crossover in a whole new direction. You're looking at an award-winning SUV. Since its launch in 2010, the designers of the Nissan Juke have been getting it right! You're looking at an award-winning SUV car. Nissan has branched away from traditional styling and the Juke is no exception. This British built crossover has led the way in crossover design! The Juke comes with Nissan Design Studios personalisation packs. These allow you to customise your Juke to suit your every preference. A strong and purposeful profile makes the Juke the perfect companion. It has rear lights inspired by the high performing 370z. It offers muscular lines and a fiercely sculpted bonnet. All giving this model unmissable presence on the road. It has the look of a 2 door sports car, whilst having the practicality of a family-friendly compact SUV. Ride high and tackle steep driveways and the bumps of the UK roads with ease. 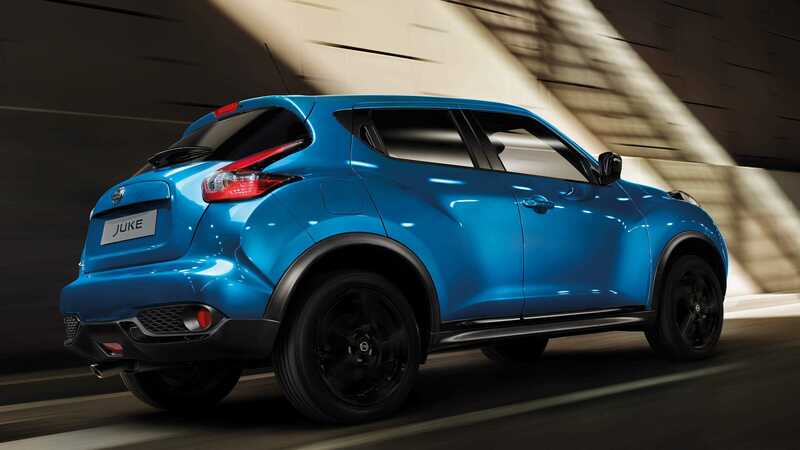 The Juke has been specifically engineered to tackle the urban landscape. The bold boomerang LED headlights mean that visibility will not be a problem. The LED Daytime Running Lights give this vehicle a modern, stand out look. INTELLIGENT 4X4 WITH TORQUE VECTORING. Nissan's individual approach to design is apparent throughout. The interior of the Juke matches the sporty character and powerful design. Open the door and witness the unmissable individuality of the Juke! Sport-bolstered seats look stylish! They also help hold you in place during more active driving. Sports bike inspired circular gauges add a sporty look to the instrument panel. There is also the option of an open-air sunroof, letting the outside in day or night. Nissan Design Studios enable you to customise the interior. Make this sporty and stylish number your own. Boasting best-in-class capacity with a 354 litre boot. Big enough to accommodate a full car and all their luggage. Even with the second row seats up, the lowered cargo floor means there is no compromise on space, even for larger pieces of luggage. The rear seats come with a 60:40 split. Fold down the seats to give yourself even more space at a whopping 1,189 litres! Adjust the flat floor to load long objects easily! Any items you want hidden? You’ll find ample covered storage under the cargo floor! The perfect balance of contemporary design and practicality does not stop there. Nissan have packed the Juke full of all the latest innovations in technology. NissanConnect: Smartphone integration means you can enjoy being fully connected to your phone and apps. Tailored to enhance your journey in a safe way. Intelligent Driver Assistance: Assistance and navigation functions support you in all kinds of situations. Streaming via Bluetooth: Enjoy DAB digital radio or stream music from your phone. AUX / USB input: Plug in your phone or MP3 player to access your entire music library on the road. The 'Around View Monitor' give you the driver a bird's-eye view of your Juke on the move. Parking has never been easier! Four cameras give you a virtual 360-degree view of your cars surroundings. With the default display as an aerial view on your dashboard you can also select split screen close-ups of front, rear and side views. This clever bird’s-eye view is set to alert you of objects you don't see with the clever integration of Moving object Detection. This is a clever dual-layer interface. This control panel allows you to swap between controls such as climate control or driving mode! This helps keep your dashboard free of unnecessary controls and buttons. Performance capability comes as standard in this compact SUV. 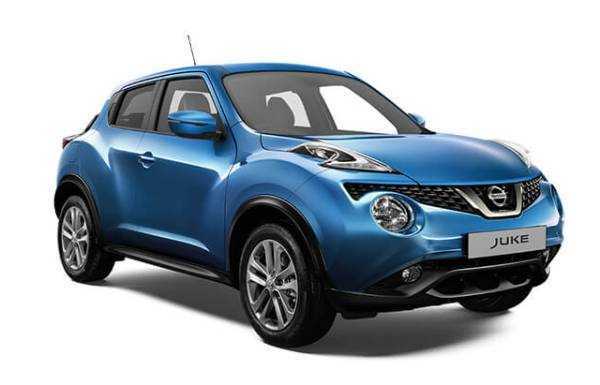 The Juke offers the perfect combination of performance and efficiency. There is a selection of DIG-T petrol engines. All come with turbo charge boost giving greater low end torque. They also come with an advanced injection system to ensure fuel delivery is optimised. Pick the engine that suits you! From the DIG-T 190 - for thrill seekers or DIG-T 115 - providing maximum economy, torque-rich kick.